Pirates, assassins and soldiers, oh my! 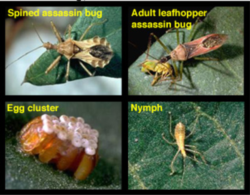 If you’ve got these adorning your flowers, vegetables and trees, how fortunate you are—if they’re bugs that is. You’ve got good bugs—ones that you want to protect and encourage to take out bad bugs that may be lurking around. 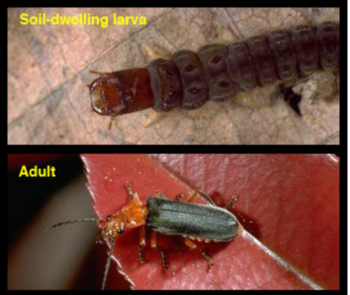 Don’t believe the outdated adage that “the only good bug is a dead bug.” For every bad bug out there, there are plenty of good ones—many working 24/7 to help control pests that assault your garden. Before you whip out the spray to wipe them out, know who you’re dealing with – and why it makes all the sense in the world to preserve and encourage the garden good guys. The world is filled with insects—there are more than a million named species of them. Yet it’s estimated that only about one percent are truly harmful. Most insects go about their daily business pollinating plants, helping to decompose dead material, being meals for birds, fish and other creatures. One big service they provide that is hidden from most of us is keeping pest populations down. Again, it’s the good bugs battling the bad ones. Garden good guys go by many names: beneficial insects, bio-control agents, natural enemies, biological pest control, and beneficials. They are garden helpers: predators, parasites or disease producing organisms that help control damaging pests by killing them, decreasing their ability to reproduce, or reducing their numbers. While the majority of beneficials are insects, there are also spiders and mites (arachnids), nematodes, and a wide range of microbes. 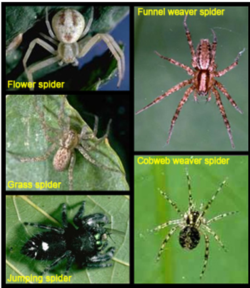 The most effective natural enemies are relatively host specific – that is, they go after a single pest species or a group of similar pests. 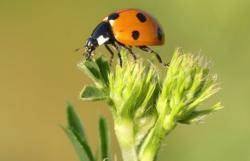 For instance, the well-loved lady bugs (Coccinellidae) are generally associated with feeding on aphids; however, other species within the group prefer to dine on scale, mealybugs, whiteflies, or mites. Great news for gardeners! Some less familiar but equally voracious beneficials are assassin bugs (Reduviidae), minute pirate bugs (Anthocoridae), soldier beetles (Cantharidae) and syrphid flies (Syrphidae). Encouraging beneficials in your garden is about the greenest method of pest control you can use. 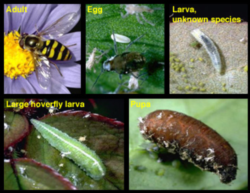 “Bug-on-bug” warfare is the way things exist in nature, and while it may not provide you with a pest free environment, if you give them time to do their magic, you can reach a level of tolerable damage without the use of any type of chemical control. It’s easy to do. • Provide the habitat they need - Like any living creature, the good guys need food, water, and shelter, all generally available in the garden. • Plant a wide variety of flowering plants - Diversity in plants encourages a range of beneficials; sequentially flowering species provide natural enemies with nectar, pollen, and shelter throughout the growing season. Some favorites include members of the carrot family (Apiaceae), dill, fennel and parsley; the daisy family (Asteraceae), coneflowers, daisies and yarrow; and herbs like rosemary and thyme. Tolerating low populations of plant-feeding insects and mites ensures that food is available to the hungry garden helpers. • Reduce dust - Dust can interfere with natural enemies and result in outbreaks of pests such as spider mites. • Don’t overdo fertilization and irrigation - Lots of lush new growth on plants actually encourages sucking pests like aphids to reproduce more rapidly than natural enemies can control. 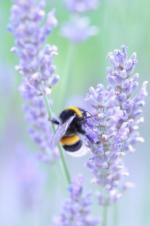 • Avoid pesticides - Don’t be too quick to whip out the insect spray. Broad-spectrum pesticides often kill a higher proportion of garden good guys than the pests they’re attempting to control. Many are killed right away (contact toxicity) and any pesticide residue can also kill natural enemies that migrate in after spraying (residual toxicity). If they do survive, the pesticide residues can interfere with the beneficial insects’ reproduction and their ability to locate and kill pests. And be careful when using combined products—ones that both feed the plant and control pests. Most of these function as systemic insecticides, circulating toxic chemicals throughout the plant, so anything that feeds directly (an aphid feeding on a rose), or indirectly (the ladybug eating the aphid) on it can be affected. at 1682 Novato Blvd., Suite 150B, in Novato (415-499-4204 or HelpDesk@MarinMG.org).